Saving Maya long listed for Saboteur Awards 2018, UK. 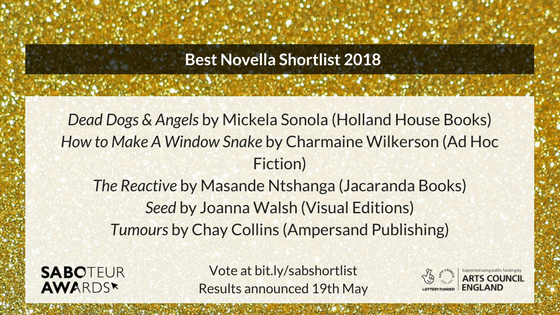 And I just discover that Saving Maya had made it to the Saboteur Awards long list in the Novella category, and the only Indian author in my category. Had no clue and didn’t even cast my hat around for votes. Thanks Ishaan Jajodia, Vivek Rao and Kausalya Saptharishi for the trust. Sabotage Reviews was founded in 2010 by Claire Trévien to provide dynamic commentary and reviews of small-scale and ephemeral literature that might not otherwise receive such critical and public attention. The focus is on independent, small-budget literature; poetry pamphlets, short stories and live performance (particularly open mic events and spoken word shows). Sabotage is representative of the hugely diverse amount of work actually being made and written in the ‘literary ecology’. They stand for inclusiveness and commitment to new voices in literature.